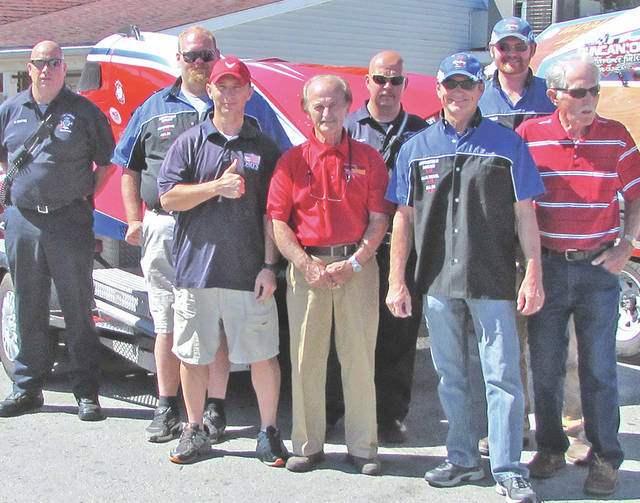 Organizers for Rumble in the Hills set for July 21-22 at Rocky Fork State Park include (front row, l-r) Keith Fickert, Joey McGuire, Mike McGuire and Ron Snyder; (back row, l-r) Chris Sexton, Greg Kneitzer, Kevin Kneitzer and Michael Glern. Just two weeks before they are set to take place, officials have announced that power boats races and other activities will return to Rocky Fork State Park this year. Now called Rumble in the Hills, this year’s races will be held July 21-22 with the races starting around 9 or 10 a.m. each day. The race course will be in the same location around two islands on the lake’s east side where more than 25 world records have been set in past years. There will also be a fireworks display on Saturday, July 21 at dark, a Budweiser beer garden both days, along with food carts and flea market vendors. After being held for 25 out of 30 years, the races were canceled in 2015 and have not been held since. The races and parking are free to spectators. Mike McGuire said there will also be a VIP area with food for sponsors. He said they are expecting more than 60 boats with six different competitive classes, plus a vintage class, that the competitive classes will reach speeds up to 160 mph, and that racers have already committed from all over the country including from Colorado, New Jersey, Florida, Virginia, Ohio, Michigan, Pennsylvania and West Virginia. Partnerships have been formed, according to McGuire, with Rocky Fork State Park; the APBA; WVNU to cover the races live; the Paint Creek Joint EMS/Fire District for rescue, for emergency vehicles and to run the tractors in the pits; Moon Tractor/Five Points Implement Co. to provide tractors; Kehn Kranes to provide cranes; several veteran’s organizations; Box 21 Dive Team; AMVETS Post 61; Merchant’s Bank; McCarty and Associates; The Print Shop of Washington C.H. for programs; Jett’s PRO Embroidery of Greenfield for promotional items; and more. He said numerous sponsors have contributed with the largest ones being Joey’s Pizza, R+L Carriers, Gibbs Insurance, Southern Hills Community Bank and Lykins Oil. McGuire said that while he and his father organized the event, it could not have happened without the support of everyone that contributed. “We have been very warmly received from everyone we’ve spoken with and formed great relationships that will last for many years to come,” McGuire said. He said that special thanks goes to all that were at a Saturday event announcing the return of the races, and members of the Rocky Fork Lake community who have offered to volunteer for the event. https://www.timesgazette.com/wp-content/uploads/sites/33/2018/07/web1_Boat-Race-pic-1.jpgOrganizers for Rumble in the Hills set for July 21-22 at Rocky Fork State Park include (front row, l-r) Keith Fickert, Joey McGuire, Mike McGuire and Ron Snyder; (back row, l-r) Chris Sexton, Greg Kneitzer, Kevin Kneitzer and Michael Glern.